The practice says that thiamine deficiency in cats is generally rare, so the number of recent cases seen in the UK has been a cause for concern amongst vets. Symptoms may include severe weight loss or anorexia, vomiting, impaired vision, dilated pupils, tremors and seizures. Prompt treatment is needed, usually in the form of thiamine injections, an oral supplement and an immediate change of food as a precaution. 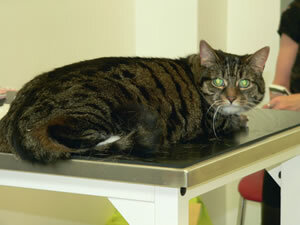 Initially most cats will show anorexia and some degree of vomiting preceding neurological signs. The latter include fairly rapid onset of impaired vision, dilated pupils, ataxia, vestibular signs, tremors and seizures. It is based on a combination of factors: clinical presentation, MRI findings, which are fairly typical (although not pathognomonic) and response to thiamine supplementation. Absolute confirmation is technically difficult and not widely available: direct measurement of thiamine in the blood may not reflect deficiency, as this is not a good reflection of tissue concentration of Thiamine. Indirect methods are functional tests looking at effects of thiamine or lack of it: demonstration of reduced transketolase activity in red blood cells which is not readily available for most veterinary practices, or other indirect methods such measuring abnormal metabolites such as organic acids in the urine. There are three main causes: 1) inability to absorb thiamine due to gastro-intestinal disease, 2) inability to process thiamine due to liver disease and 3) decrease level of thiamine in food. The latter can be caused by the heating process used for food preparation (thiamine is destroyed by heat), addition of sulphur dioxide or sulphite preservatives to meat which inactivate thiamine and feeding food rich in thiaminase activity such as some raw fish. Therefore all-raw fish diet in cats can be a cause of thiamine deficiency. What should you do if you suspect you have a cat with thiamine deficiency and whose diet consists of a product being recalled?